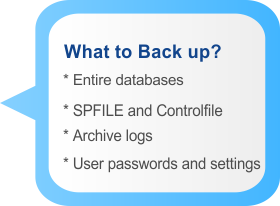 Handy Backup provides fast, effective and affordable Oracle backup software solution, based on internal Oracle backup functions and effective data-management technologies. Try the might of this tool, to be protected from any perils to your Oracle-based data! The software can perform Oracle hot backup. Hot backup can be performed only in ARCHIVELOG mode enabled. For databases in NOARCHIVELOG mode data transactions must be stopped. With the most powerful Handy Backup Server Network tool, you can backup not only server-based Oracle databases but workstation Oracle data, too. Other editions operate only with local Oracle data. All versions of the software for Oracle backup can perform a full, incremental or differential backup of Oracle databases. 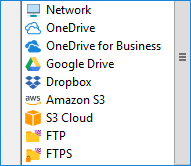 A possibility to run backup as Windows service, completely shadowing all unnecessary disturbance to user that a program can make in the standard dialog/window mode. Handy Backup works uncompromised with all versions - Oracle 12c, 11g, 11c and any lower. It automates standard data-keeping tasks such as organizing Oracle incremental backup, using common and specialized methods. As a standard database, any Oracle data can be processed with the generic Database plug-in using ODBC. Use this method only if you are really need it, otherwise, look up to a next method. Alternatively, specialized Oracle backup methods used by software mentioned are based on possibilities and options of reliable RMAN software utility provided by Oracle to cover any backup and restoration activity. RMAN Backup GUI: Acting as a bridge between ODBC or RMAN and common user backup interface, Handy Backup tool allows both operating in a common environment to plan any backup schemes with different types of data and backup Oracle database using only stable and reliable methods approved and tested by product developer. For newly distributed Oracle 12c Handy Backup utilizes the same Oracle plug-in as for other Oracle-related tasks. It completely replaces any Oracle 12c RMAN backup script, allowing both making Oracle 12c backup and doing a recover table from RMAN backup to an Oracle DBMS. No any difference from common Oracle backup. You can learn how to backup Oracle database 12c version from the User Manual. The plug-in utilizes the same RMAN backup methods for Oracle 12c backup as for other Oracle applications. Many data sources available, automating backing up any data type (including Oracle data). A possibility for compressing and strongly encrypting data when backing it up. 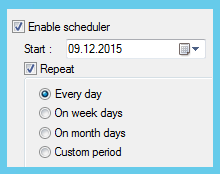 Logging all the activities performed, with an E-mail notification service included, as well as checking tasks through a dedicated Backup Reports window option. To call for automatic Oracle secure backup, you can use the dedicated “Oracle” feature available at a Step 2 of new task creation. This feature shares all common options listed above, including Oracle incremental backup with a continuous upload of copied files on some offsite location. There are two editions of the software for Oracle backup: the Small Server solution and the Server Network solution. Also, to backup or restore workstation-based Oracle databases you must purchase as many Workstation Agents (for Windows or Linux, with native support of later OS) as you need. To back up and restore your Oracle databases, you need to use the Small Server edition. 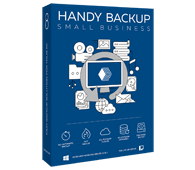 Free 30-days trial version for perfect small business backup software! The specialized Oracle backup plug-in uses RMAN interface and delivers greater speed and some extra possibilities compared to generic driver. It can be purchased for all non-server editions for $29, and is available out-of-the-box in both server-designed editions. Compare solutions for database backup. Both a lifetime license and technical support are already included to these price tags. No extra payments are presumed. These statements make Oracle backup software - Handy Backup one of most affordable purchases on the backup software market.